The Parker 51 went into production in 1941, and remained a best-seller for decades thereafter. The majority of examples in circulation, however, date from the 1950s. Perhaps no other fountain pen has been so unanimously acclaimed as a classic. Nor is it merely a triumph of styling -- though it has a place in the Museum of Modern Art's design collection, and Lazlo Moholy-Nagy found it worthy of praise -- for it is also one of the most robust and practical writing instruments ever made. Design changes were relatively few. First-year examples, such as the pen above, had a number of distinctive features, including "jewels" at both the cap top and barrel end (more on first-years); from then through 1948, pens could be single- or double-jeweled -- though double-jewel pens postdating 1946 are very much the exception. The sectional view below comes from a Parker repair manual from 1947. In 1947 the arrow clip was simplified, eliminating the earlier Blue Diamond mark (for the simplified clip, see the image at the top of the page), and at the end of 1948 the filling system was changed from a multi-stroke pump (taken over from the Vacumatic; cross-section above) to a squeeze-bulb ("Aerometric") with a transparent "Pli-Glass" sac (see photo below). While the earlier filler had the larger ink capacity, the Aerometric was simpler and more robust, with a more intuitive mode of filling and a special vented sterling silver breather tube to reduce the likelihood of leakage during flight. All Aerometric pens were single-jeweled. Although the "Pli-Glass" material has often been misidentified as nylon, these sacs were in fact made of PVC (vinyl). A short model, known as the Demi, was introduced shortly before the Vacumatic filler was phased out. Aerometric Demis are slightly longer than Vac-filler Demis, and more slender. The 51 Special was a later addition to the line, an economy version without a gold nib and with a simplified Aerometric filler mechanism. Specials also usually have caps that are polished bright rather than frosted, and a cap jewel that is black, not pearlescent (note, however, that late-production Specials from the 1960s resembled normal 51s, with frosty caps, pearl jewels, and gold nibs). Other notable members of the 51 series were the Flighter (cap and barrel in stainless steel), Signet (gold filled cap and barrel), Heritage (solid 14K gold trim), Heirloom (solid 14K gold cap and trim), and Presidential (solid 14K gold cap and barrel; 9K and 18K versions in the UK). Sterling silver and coin silver caps were also available, but were discontinued before the introduction of the simplified arrow clip and Aerometric filler. Demonstrators in clear Lucite were made for dealer use, but not sold to the general public. The great majority of 51s were made in the USA at Parker's Janesville factory, but 51s were also produced in Canada and England; distinctively English are the Aerometrics with caps in rolled silver, along with those with rolled silver caps and barrels (watch for fakes: if the barrel is not marked "R. SILVER", it is almost certainly a gold filled barrel that has been plated). Parker also made 51s in South America at its factory in Argentina. Although it has often been repeated as fact that 51s bearing a "T"-prefix date code were assembled in Parker's Toronto plant, there are strong reasons to doubt this (full discussion here). Matching pencils and desk sets were offered throughout the 51's production run. In 1955, a matching 51 Jotter ballpoint was introduced, along with the so-called Liquid Lead pencil -- a nonretractable ballpoint using a graphite slurry. Current Parker ballpoint refills fit the 51 Jotters, but the Liquid Lead refills (which reportedly never worked all that well) have long been unavailable. Parker also manufactured 51s in Canada and England, and later in Argentina. Some 1946 and 1947-dated 51s bear date codes with a "T" prefix, which has led to (incorrect) speculation that the "T" stood for "Toronto" -- even though such pens are all clearly marked "MADE IN U.S.A." In fact, the "T" surely denotes pens from Parker's new Janesville production line, set up to meet postwar demand in the former Townsend Tractor building. This transparent demonstrator reveals the fine-finned "collector" hidden under the 51's hood. Its prodigious ability to trap ink makes the Vac-filling 51 a slow pen to empty. 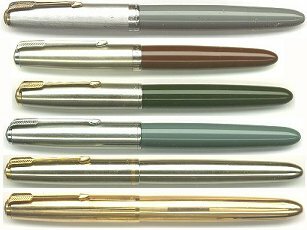 Many Parker 51s survive in usable condition. Nonetheless, professional overhaul is a good idea, even for pens that seem at first glance to be in good working order. Often a "working" Vac-filler which still has its old diaphragm will begin to show irregular flow, or will even release a sudden flood of ink as the age-rotten rubber fails. For this reason we install fresh diaphragms in all Vac-fillers that we sell. From top to bottom: a Dove Grey 1946 Vac-filling 51 with sterling silver cap and Blue Diamond clip; a 1947 Vac-filling Demi in Cordovan; a Forest Green 1949 Aerometric Demi; a 1950 full-size Aerometric in Navy Grey; a Flighter with stainless steel cap and barrel and inlaid gold filled cap band, c. 1952; and an English-made Signet with gold-filled cap and barrel, c. 1964. Unless otherwise noted, the caps are of Lustraloy, Parker's matte-finished stainless steel. Blue Diamond clips are normally gold-filled, whereas the later arrow clips usually (but not always) match the cap's color. Aerometric 51s used a transparent synthetic sac that is extremely durable but prone to darkening (new replacements are available here. Still, Aerometric fillers are by no means entirely foolproof, and are often found with clogged or corroded breather tubes (see Basic Parker 51 Aerometric Repair). Pens with breather tube problems will only fill to around 1/4 of their proper capacity, and with their reservoirs filled with air instead of ink, they will be prone to flooding and irregular ink flow. The 51 was so named because development was completed in Parker's 51st year. A number was chosen because it could be used in any country, obviating barriers of language. The U.S. design patent for the Parker 51 was 116,097. For more on the origins of the 51, see the article by Zazove & Fultz in the Fall 2000 issue of The PENnant, now available online here. This essay should help put to rest the persistent myth of Moholy-Nagy as the designer of the 51, restoring credit to the designing trio of Marlin Baker, Gaylen Sayler, and Milton Pickus. For an older discussion of Moholy-Nagy's actual design work for Parker, see Abe Schwartz's article in Pen World, 6/5 (May/June 1993). An important article by Fultz, Zazove, & Hiscock, "The Parker 51 Before 1941: Development and Test Marketing", is found in Pen World, 17/7 (Aug/Sept 2004). The contents of most of the articles noted above have been incorporated into the text of an outstanding monograph on the 51, written by David and Mark Shepherd and privately printed at the end of 2004. Parker released a redesigned "special edition" 51 in autumn of 2002. This 51 externally resembles the double-jewel models of the 1940s, but its internals are considerably simplified. Not only does this 51 use cartridges, it lacks the sophisticated, ink-trapping collector of the original 51, and uses a small, conventional nib instead of the original tubular design. Mechanically, it seems to be closer to the 51 copycats of the 1940s, such as the Waterman Taperite and the Eversharp Fifth Avenue, or to the later Parker 45. After numerous reports of cracked barrels, Parker manufactured a quantity of thicker-walled replacement barrels. This supply was soon exhausted, however, and before long it became clear that even the replacement barrels were crack-prone. The Aerometric filling system is shown below in an extract from an original ad, c. 1948. Note the fine-finned "collector" under the hood and surrounding the base of the nib. The new filling system was initially advertised as the "Foto-Fill" filler, with the term "Aero-metric" applied to the pressure-equalizing venting system provided by the specially-designed sterling silver breather tube.